How do academic social scientists and survey professionals use social measurement techniques? How are these techniques applied to specific concepts in empirical research? 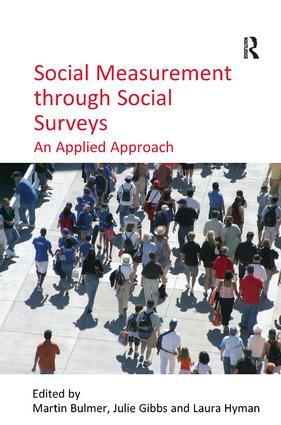 This book is an important resource for students, academic and professional researchers, offering an overview of both new and practiced methods of social measurement for quantitative survey research. It will provide readers looking to investigate "hot" social science topics with a way of learning how key measurement techniques can be utilised in that topic in a practical way. Emerging from the editors' widely used work on an online social survey resource offering information on key social surveys and their questionnaires entitled ’Question Bank’, this book aims to take this material further. It elaborates on the problems involved with this resource type, providing a comprehensive and unique volume that will enable the reader to have the confidence to use this technique in their own research. Martin Bulmer is Emeritus Professor of Sociology at the University of Surrey, which he joined in 1995. He was previously Professor of Sociology at the University of Southampton and before that he taught at the London School of Economics for seventeen years. He is an Academician of the Academy of Learned Societies for the Social Sciences and the Director of The Question Bank. His research interests cover the methodology of social research, the history of the social sciences, the study of ethnicity and race, the application of sociology to public policy and the sociology of social care. He has published more than twenty books, most recently Questionnaires (4 vols, Sage, 2004) and Researching Race and Racism (ed with J. Solomos, 2004). Julie Gibbs is Senior Research and Information Officer at the Information Centre about Asylum and Refugees at City University, London and was Content Manager and then Manager of the ESRC Question Bank 2001 - 2008. Laura Hyman is a Research Student in Sociology at the University of Surrey and was a Research Officer for the ESRC Question Bank, 2005-2007.